On this day in 2011 Sheffield Wednesday came from two goals down in emphatic fashion to secure a point at Bramall Lane on their way to promotion from League One. The Owls, under the watchful eye of manager Gary Megson, scored two in four minutes to rescue the tie against their city neighbours. United had gone ahead early on as Stephen Quinn and then Ched Evans found the back of the net to give ex-Wednesday manager Danny Wilson’s side a 2-0 advantage. But Chris O’Grady and Gary Madine would spoil the party for Wilson and over 28,000 fans packed in to Bramall Lane with two goals at the death. On 82 minutes O’Grady pulled one back through a far post header before Madine rose highest to nod the equaliser past Steve Simonsen. 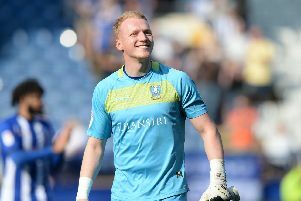 The derby was the first for childhood Owls fan Megson and the first for United boss Wilson since he was in charge at Hillsborough in March 2000. Wednesday would go on to finish the season in second place to secure automatic promotion to the Championship, although Megson was sacked as manager in February 2012 after a 1-0 win in the return Steel City derby fixture.